Choosing the best fuel management system can be a confusing process. This article is designed to help you choose the best fuel management system for your needs. The two most common questions we get are: Do I need a fuel management system? and Which fuel management system would be best for me? This article is designed to help answer those questions for you. Do You Need a Fuel Management System? There are many dealerships and shops out there that will tell you if you're just doing slip-ons and not a high performance air filter that you can get away without having your bike tuned. While this may be the case, especially if your motorcycle has a catalytic converter in the head pipe, we always recommend having your bike properly tuned to ensure optimal performance and longevity of your engine and exhaust components. Anytime you change exhaust you’re changing the amount of back pressure seen by the engine, which in turn affects your Air / Fuel or A/F ratio required for complete combustion. Since the muffler section (the part replaced by slip-ons) is where the majority of the back pressure to the engine is generated (catalytic converters also generate a fair amount of back pressure when located in the head pipe) it is very important to make sure your engine is properly tuned. Later model bikes often have O2 sensors, and so many people think they do not need a fuel management system and that their bike will make adjustments itself. Unfortunately out of the factory most bikes still run in open-loop mode during idle and lower RPM levels meaning that they are still using the factory map on the bike’s ECU which is tuned for factory exhaust and only switches to closed loop mode after a certain throttle position. Motorcycle manufactures do this to ensure they pass EPA and other governmental regulations. For this reason motorcycle manufactures also typically program their bikes to run very lean in this RPM range which robs you of power and causes your bike to run hotter and this can be corrected with a proper tune. Ok Which Fuel Management System is Right For Me? TAB Performance currently carries three types of fuel management systems all of which are outlined in the table below. Performance Upgrade Limit - This is the maximum level of performance upgrades the fuel management system is designed to handle. For convenience and simplicity we've broken the most common performance upgrades into three stages. Our definition of these stages are not meant to be all inclusive of performance upgrades available and might very slightly from industry standards but should give you a good overall idea. STAGE I - The most commonly seen performance upgrades which typically include: high performance exhaust system (could be slip-ons or full system), high performance air intake (i.e. K&N filter or modified intake), and a fuel management system. STAGE II - Includes performance modifications such as boring cylinders / larger pistons, changing cams. STAGE II modifications often require the ability to adjust timing. STAGE III - Includes performance modifications more commonly used for race motorcycles than street bikes such as turbos, blowers, nitro. Installation Difficulty - This is the level of difficulty required to install the fuel management system. For simplicity we've broken it down into three categories: Easy, Medium, and Hard. Easy - Almost any customer should be able to handle the installation with the help of the instructions and a few common tools. Requires no cutting, grinding, or modification of any kind. Typically only requires plugging the device into a couple of plugs. Medium - Most customers should be able to handle the installation with the help of instructions, but may require some mechanical skills and or specialized tools. Typically requires very little modification, but installation requires plugging into multiple plugs and locations, wire tapping and may require disassembling / re-assembling areas of your motorcycle complete installation. Hard - Generally best if installed by a professional or very mechanically inclined customer. Could require cutting, grinding, welding, specialized tools and / or other modifications to your motorcycle. Installation instructions may be more vague and require the installer to make decision based on their own requirements. 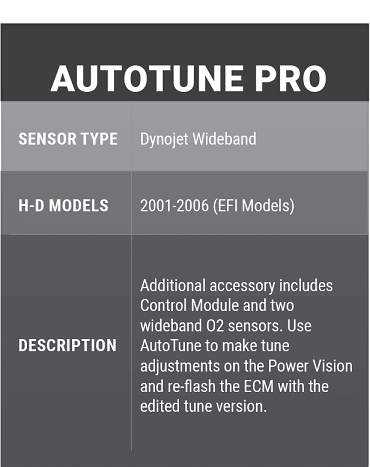 Auto Tuning Capabilities - This means the fuel management system has the ability to make adjustments based on the readings it receives from the O2 sensors. Learning Capabilities - This means the fuel management system has the ability to learn and automatically make map adjustments as you ride. Non-learning auto tuners make adjustments as you ride, but to not save or " learn" these changes. 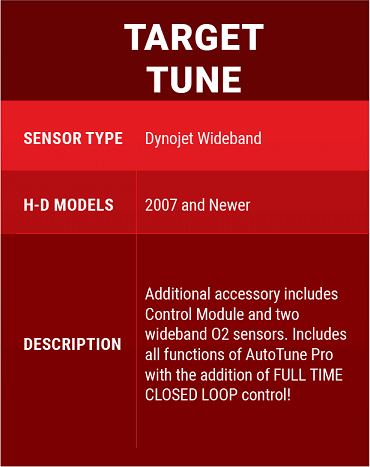 Dynamic Mapping - Fuel management systems with dynamic mapping such as the TAB Performance Auto Tuner have the ability to adjust their target AFR on the fly to give you optimal performance when you're getting on the throttle and optimal fuel economy when you're just cruising down the highway. Air Fuel Ratio (AFR) Target - Air Fuel Ratio, also commonly referred to as A/F Ratio or AFR is the ratio of air to fuel to be injected into the cylinders. The higher the number the "leaner" (more air, less fuel) the mixture and the lower the number the "richer" (less air, more fuel) the mixture. The Stoichiometric, or calculated AFR to produce a chemically complete combustion for gasoline is 14.7. Due to inefficiencies, variances in fuel quality, and fuel economy concerns AFR targets are typically not set to the Stoichiometric ratio. Running slightly richer typically produces more power and cooler engine temperatures where running towards the leaner side improves fuel economy. 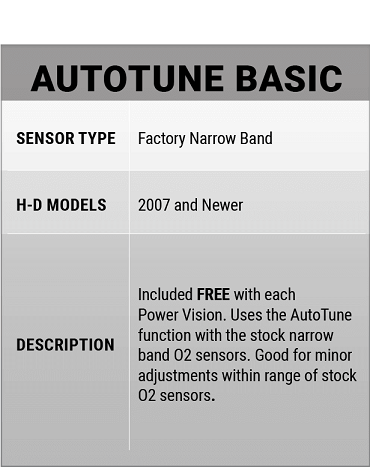 Factory O2 Sensors - The factory O2 sensors are typically a narrow band. Narrow band O2 sensors are oxygen sensors that generally only know if the mixture is rich, lean, or on the AFR target. This means the sensors can not tell the computer how far off it is from it's target so the computer has to make small changes and then take another reading until it zeros in on it's target. Wide Band O2 Sensors - Wide band O2 sensors emit a varying range of voltages that correlate to how far off the AFR target the engine is running. This allows the computer to more quickly narrow in on the AFR target. Timing Adjustment Capabilities - Ignition timing refers to when the ignition system sends the signal for the spark plug to fire. Typically a few degrees before the piston reaches top dead center (TDC) on its compression stroke. Ignition timing is measured in the degrees corresponding to the crankshaft as it rotates. Timing is very important when it comes to producing maximum performance. For example if ignition happens after the piston starts traveling back down the cylinder the pressure of the air/fuel mixture will decrease and result in a weaker combustion, robbing the engine of power. Being able to adjust timing is important if you plan on making major upgrades like STAGE II and above. Below is a more detailed description with additional information on each of the fuel management systems we offer.